There I am above at nine months pregnant waiting anxiously for our baby girl to arrive, and below is me just four weeks later holding her in my arms! My month of postpartum confinement ended yesterday (Woohoo! Hello, outside world and spicy food! ), and I’m so excited to share my experience here on the blog! 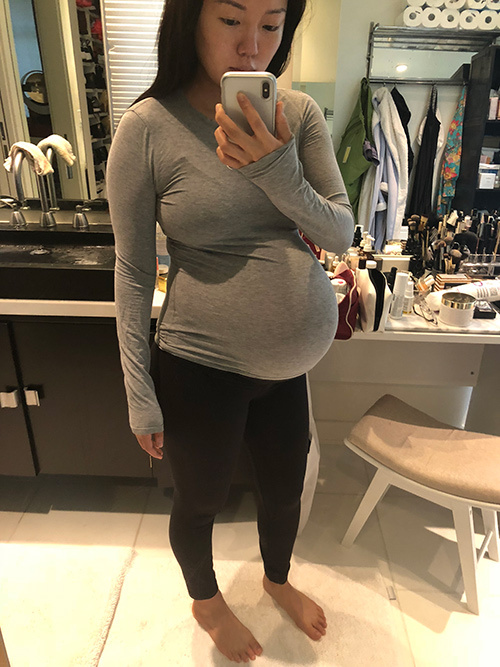 Check out my previous post, “I Plan On Following The Chinese Practice of Confinement Postpartum,” if you haven’t already, to get up to speed on zuò yuè zi and the full explanation of this practice. 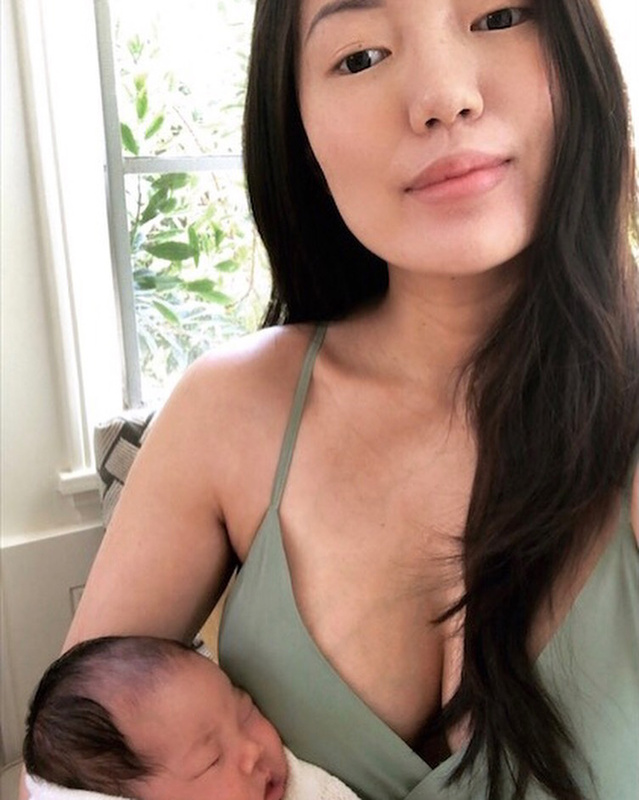 Below I recap my month of confinement: foods I ate, Chinese herbs I took, which rules I actually followed and my overall thoughts on the pros/cons of this ancient postpartum tradition. The postpartum diet during the confinement month is the cornerstone of this Chinese practice. Specific nourishing foods are eaten to heal the body. Two of the main objectives are to (1) restore nutrients and build up the blood (since a lot of blood is lost after delivery), and (2) provide healthy nutrition to support the mother’s milk supply. I didn’t realize how much vaginal bleeding takes place postpartum!? It’s not really something many women talk about, so it shocked me a little when I soaked through a pad my first night postpartum, then my second and third. This bleeding continued and slowly tapered off over the course of three weeks, which when you think about it is a lot of blood to lose. This vaginal bleeding postpartum (present after vaginal and cesarean section deliveries) is called lochia and is the body’s process for “expelling extra blood and tissue in the uterus that helped the baby grow” (WebMD). Because of this daily bleeding, there’s an emphasis in the beginning stages of the confinement month diet to restore lost iron, B vitamins and trace elements like magnesium and zinc by consuming organ meat, specifically liver and kidneys. 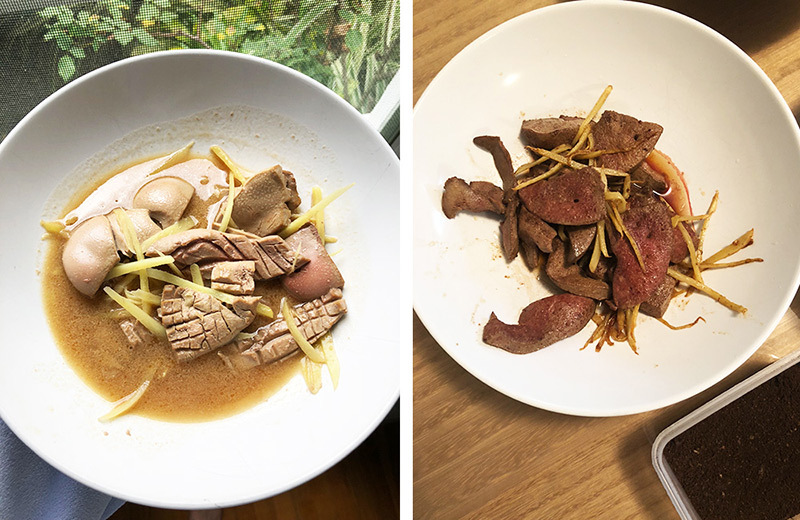 My Chinese postpartum nurse cooked the below (left, kidneys; right, liver) by lightly sautéing them with a little bit of sesame oil and sliced ginger. The flavors and textures were soft and surprisingly enjoyable. So much so that I plan on continuing to eat liver on a regular basis going forward, especially after I read about liver’s crazy health benefits. It’s basically a superfood! Liver is the easier of the two organ meat dishes to make at home, since cooking kidneys requires specific cleaning protocols, so I thought I’d share the recipe below. – Add a little black sesame oil to pan. Stir fry sliced ginger. Add liver, no salt. Voila! Around day 4-5, a mother’s breast milk comes in postpartum. Therefore at the end of week one and continuing throughout the rest of my confinement month, each lunch and dinner meal I ate included a nourishing soup made with collagen rich foods and galactagogues (foods that promote lactation) – peanuts, seaweed and green papaya. I was never a fan of chicken feet before, but somehow I’ve been converted and now love them! These soups are delicious. Bone broth was used as the base for each one for its ability to boost immunity, gut health and tissue repair. 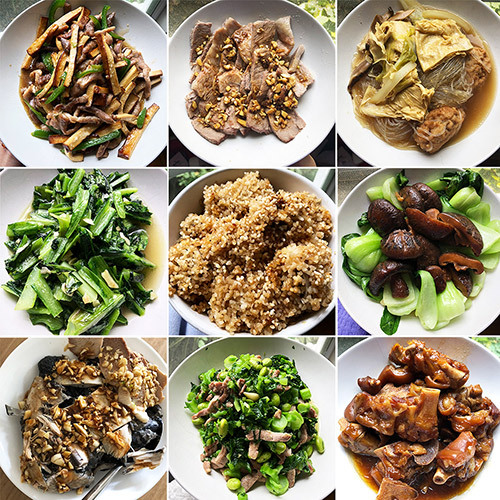 Almost every day at each meal, I would eat one of the above soups paired with sautéed liver or kidney meat, and one or two of the vegetable and meat dishes pictured below. Overall, I really enjoyed the postpartum meals during my confinement month! There was very little oil used, almost no salt, no sugar, no dairy or gluten. The diet consisted of more meat than I normally eat, but throughout the entire month, I felt nourished and energized which I believe had to do with the high protein aspect of the diet. Even when I was operating on two hours of sleep, somehow I never felt drained. I think its because my diet was so rich in iron, collagen and vitamins. My husband even commented on how shocked he was that I had more energy than him, even though I was the one getting up every hour or two to do feedings. While the food played a big role in my recovery, so did the next section – Postpartum Chinese Herbs. Throughout the course of my confinement month, my postpartum nurse, trained in Taiwan on Chinese herbs, encouraged me to continue drinking the Chinese Red Date Tea she advised me to consume throughout my pregnancy for an easy delivery. She said the high antioxidant content of the goji berries and red jujubes would support my recovery, and the astralangus would offer needed anti-inflammatory benefits. Not to mention, she said, it would make my skin glow. I drank about one liter of this tea every day postpartum. See here for the recipe. *PS. I’m a believer in the health benefits of this tea! If you read my blog post on it, it explains how this tea helps support a fast and easy delivery. Well, I drank it for four weeks prior to my estimated due date, as well as consumed dates every day, and my labor and delivery were so smooth! I was able to do it without any interventions (no drugs), I was only in active labor for 8hrs and I only pushed for 50 minutes and out she came! 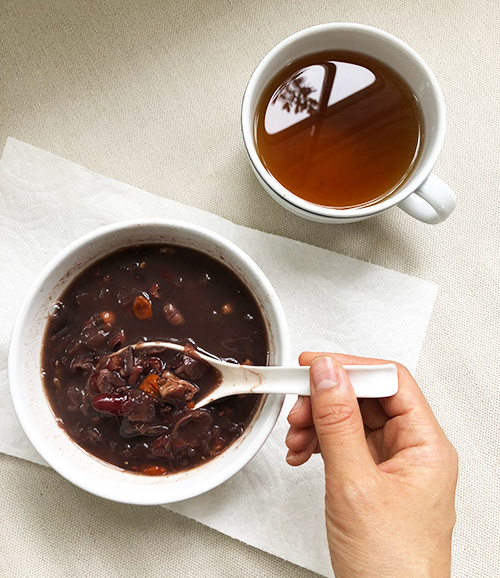 Sheng Hua Tang is a blend of postpartum Chinese herbs widely used throughout China and Taiwan during the confinement month meant to encourage uterine contractions to dispel remaining placental blood and tissue, and return the uterus to the prenatal size. 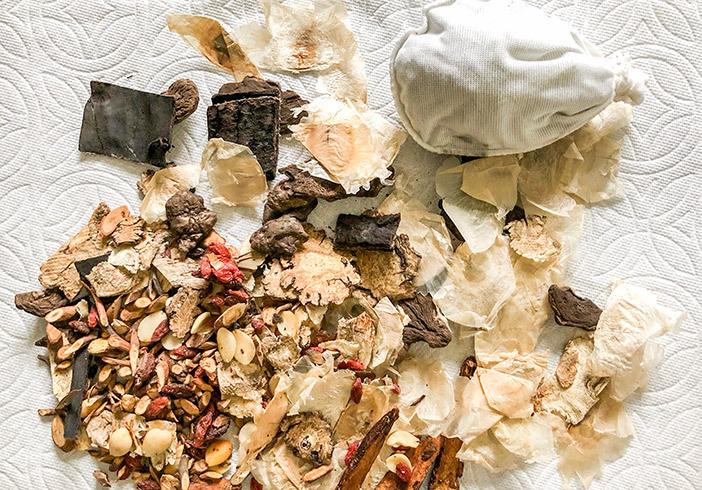 About 80% of women in Taiwan take these postpartum Chinese herbs during their recovery. My postpartum nurse, Jessica, who’s Taiwanese, brought these postpartum Chinese herbs back from Taiwan for me. And instructed me to drink them brewed overnight in hot water every morning on an empty stomach starting on the fifth day after delivery. Jessica said it would help to make sure the uterus is “clear, clean and warm” after birth. I drank this tea for ten consecutive days postpartum. On the first two days taking it, I did feel more uterine contractions than normal and noticed a visible increase in vaginal blood loss. While it’s common for vaginal bleeding to last anywhere from 4-6 weeks, my bleeding ended after three weeks and my uterus went down to its original size by my first postpartum OBGYN appointment. There isn’t a lot of scientific literature on Chinese herbs, but I did come across an interesting study published in the Asian-Australasian Journal of Animal Sciences in 2013 on the effects of Sheng Hua Tang given to dairy cows postpartum. Most dairy cows have a lot of lochia after delivering their calves. Often their uterine cavity is contaminated by bacteria, so it is vital all of the remaining uterine tissue and blood be completely flushed out in the weeks after giving birth to prevent infections. The study’s objective was to see if giving the cows, through intravenous injections, the postpartum Chinese herbs – Sheng Hua Tang, would encourage a faster and healthy recovery stimulating uterine contractions to dispel any remaining cavity tissue and blood, thus avoiding infections and the need for antibiotics. The results: The flushing out and recovery of the uterine cavity of the group of cows given Sheng Hua Tang was earlier than the control group not given the Chinese herbs. And the group given Sheng Hua Tang returned to fertility, marked by first ovulation, much earlier than the group of cows not given this herb blend. Overall, the study concluded that Sheng Hua Tang led to earlier uterine and ovarian recovery in dairy cows postpartum. Now, whether or not you can translate these results to humans is debatable. But just wanted to share this interesting study. – Where can I buy Sheng Hua Tang? My postpartum nurse, Jessica, brought me ten packets of Sheng Hua Tang from Taiwan. But the herb blend can be purchased at Chinese herb shops. I wanted to know where I could get Sheng Hua Tang for my next pregnancy, so Jessica took me to 99 Ranch, a local Chinese grocery store with an herb shop inside of it where Sheng Hua Tan is sold. I’ve been to Chinese grocery stores before, but never ventured into the herb/medicinal shop-in-shop before. It was sort of like a mini pharmacy with packages and glass jars of dried herbs lining the walls. Jessica told me I could go there and tell them any ailment – insomnia, low-energy, back pain – and they would pick specific herbs for me to take to address this issue. The herbs can be brewed into a tea and consumed on their own, or they can be added to soups. See below for the herbs. Once I finished my ten days of consuming Sheng Hua Tang, Jessica instructed me to begin taking my placenta pills. She had me wait until I finished taking the Sheng Hua Tang since its purpose is to flush everything out, while the placenta pills are meant to rebuild, so they could counteract each-other. You wouldn’t want to flush out and try to rebuild at the same time. Consuming ones own placenta for postpartum benefits (and skin benefits) is something I knew I wanted to do since way before getting pregnant. 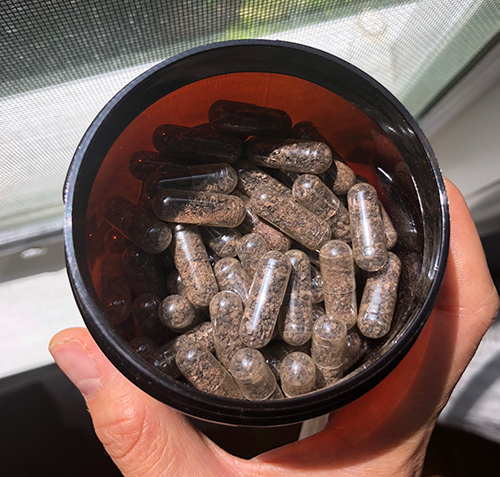 My interview with doula, Paula Mallis, on placenta encapsulation taught me a lot about the benefits of eating ones own placenta: staving off postpartum baby blues, restoring hormonal balance and improving mood/energy levels. The practice just always made sense to me. Then when I learned ingesting placenta can brighten and improve the skin during my trip to Tokyo a few years ago, I was convinced I would ingest my own after giving birth someday. The doula we hired to support me during labor (the best decision ever – since I opted to have a drug-free vaginal delivery) was also capable of encapsulating my placenta. When she arrived at the hospital, she brought with her a cooler to take my placenta home where she cleaned, steamed, dried and encapsulated it. The cost was a little steep – $375 – but I am loving the benefits so far! My skin has never looked better. I feel great. But of course it’s hard to know if it’s the placenta pills or any of the other things I’ve been doing to maintain my vitality postpartum (Chinese red date tea, eating liver, etc). There are a lot of rules tied to the confinement month practice. Most of them I abided by, but I didn’t stress myself out about adhering to them all in a strict manner. I drank cold water when I felt I needed it, washed my hair pretty regularly, and went on one or two short outdoor walks. But other than that, I tried my best to follow the others. Jessica was flexible with me. I’ve heard stories of postpartum nurses from my friends who scolded them for eating cold foods or going outdoors, but luckily Jessica was relaxed. *If you’re looking to hire a Chinese postpartum nanny to help guide you through this practice and want to modernize the rules to fit your lifestyle, you will definitely want to inquire about this during the interview process. *For more on the specific Chinese confinement rules read here. Overall, I really enjoyed my month of confinement! The first two weeks postpartum, I didn’t even want to leave my house. Time seemed to have no meaning. The days and nights blurred and all I could focus on was my new baby. My confinement month felt like being in a cocoon so far removed from the rest of the world where all that mattered was her. I wasn’t worried about getting back to my daily routine, or concerned with going anywhere, and visitors were kept to a minimum. This allowed our little family time to bond and recover with very little stress. My body feels great and mentally and emotionally I feel restored. This practice was so amazing and I really encourage other moms out there to look into whether this practice, or aspects of it, would be right for them postpartum. Whether that’s by hiring a Chinese postpartum nurse, having confinement month meals delivered to your home, or cooking them in advance yourself with this cookbook on confinement recipes. It’s such a great way to be supported with nourishing foods and restorative herbs. I feel completely recovered: my energy levels are good; my hormones and emotions feel balanced; and I feel grateful to have had this wonderful month to be with my baby! *Pregnant? Read about preparing for the fourth trimester with doula Kimberly Johnson.